First-Aid Kits are kind of a funny prepper item - there are SO many that you can just go buy that it doesn’t seem like a big deal. Yet, countless people I know barely have a box of band-aids in their home. Those who do go purchase a pre-made First-Aid Kit don’t typically pay much attention to it - it’s crossed of their ‘list’. But day to day use of the only medical supplies in the house means that after a year or so the First-Aid Kit is severely depleted and nobody notices until there’s a need for it. Putting together your own First-Aid Kit is a pretty personal thing - it reflects your families medical situation and shows what you think you might have to treat someone for. For my family, we have endless supplies of medical stuff including a lot of specialized equipment. We have a 2 year old daughter with Leukemia and a 4 year old son who has some intestinal issues. We are also home birthers and use a lot of natural treatments. I explain all this because I’m about to show you some of our medical kits. 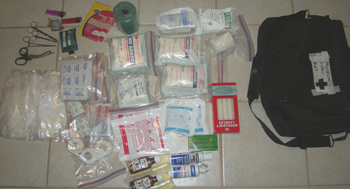 These kits are specifically supplemental to our cases of medical supplies and to our extensive medicinal storage. Many of the things you won’t see in these kits are in our extended supplies. 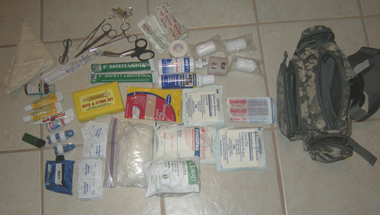 The following 2 kits are put together for a bug out scenario (see picture above). One is a Fanny Pack that attaches to my MOLLE BOB and the other is a messenger bag that can be carried by any of the family. 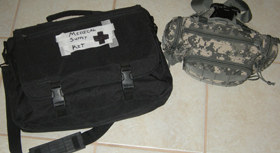 The Fanny Pack is more of a Triage system while the Messenger bag is more of a resupply and extended storage of things needed post-triage. I’d love to hear other things you keep in your First-Aid Kit and any ideas you have for adapting mine.